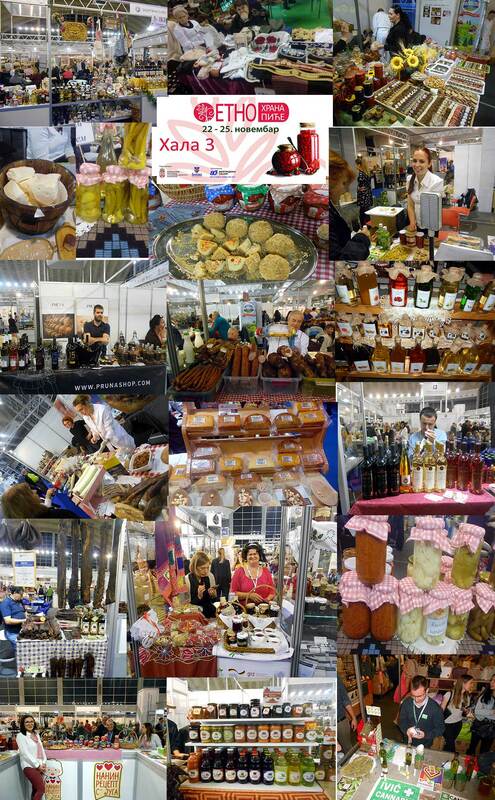 The most exotic Serbian f&d event, Fair of Serbian ethnic food and drinks, was held this year in its twentieth edition, in the central hall of the Belgrade Fair in the last week of November. This event is extremely interesting because it includes food and drink small producers from all over Serbia, so you can find a different home-made food, from the Pannonian to Oriental cuisine, and also some extraordinary things specific to the Balkans area only. So homemade food, prosciutto, bacon, greaves, chutney, brined vegetables, and a huge amount of cheeses of all kinds from light white to hard smoked.Also homemade jams, in the range of raspberry and blueberry to pumpkin and pepper :). If we talk about drinks, I have to point out that the wine offer was significantly smaller than in the previous years., I do not know why. In the other hand brandy producers overlooked all expectations, a huge and varied offer, for the first time I tried brandy of wild pear, brandy of wild quince, rose petal liqueur, and as a very interesting brandy of honey with (medical) cannabis.A first class gourmet event, sincere recommendations to visit!